Kuala Lumpur Sentral, Kuala Lumpur. TO TOSS or not to toss yee sang is not something one ponders over as there is only a short window to do so each year. 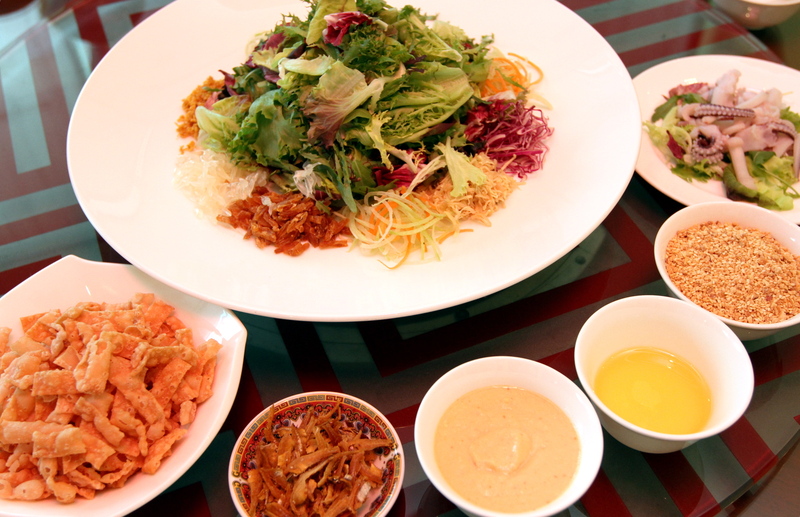 After all, yee sang is a festive offering associated with the Lunar New Year. Those who believe in tossing yee sang for an auspicious year ahead, will certainly look forward to picking up their chopsticks to loh hei more than once. As the mixed salad (top pic) of sorts is only available for a limited period, it is good to know that there are various types that have been concocted at Chinese restaurants, in and around the city. 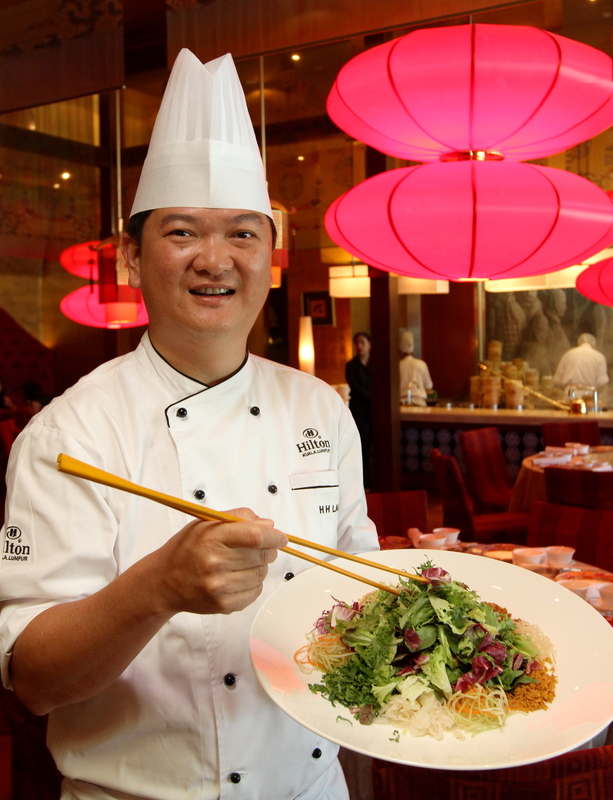 It is no different at Hilton Kuala Lumpur as Chinese executive chef Lam Hock Hin spent a good half of last year thinking of an exciting yee sang flavour that would get tongues wagging. To welcome the Year of the Monkey, Lam’s yee sang is like no other. Hilton Kuala Lumpur executive Chinese chef Lam Hock Hin with the Mixed Salad with Squid Tentacles and Coconut White Curry. So unique is his signature yee sang for 2016 that it can either win you over or make one frown at the lack of traditional ingredients often found in the dish. The mere mention of The Mixed Salad with Squid Tentacles and Coconut White Curry will certainly raise an eyebrow because Lam omits regular yee sang staples such as pickled vegetables and strips of fried yam but uses salad leaves instead. To make things more out of the ordinary, he throws in savoury sauce instead of sweet plum sauce to bind the ingredients together. Indeed Lam’s new yee sang flavour got the conversation going as curious taste buds longed for a taste of this uncanny appetiser as soon as it was placed on the table. Eight types of salad leaves, peanut oil, peanuts, fried anchovies and crunchy crackers get tossed with the star ingredient, which are the squid tentacles. However, the squid shared the limelight with the thick and slightly spicy coconut cream sauce, pepped up with a sprinkling of curry powder, lemongrass, ginger, onion and of course, coconut milk. Lam was ready for an onslaught of questions the moment everyone had their fill of the novel piquant yee sang. And so that explained it all. There is nothing like a menu that is redolent of local flavours injected into a Chinese New Year spread, especially when dining at Chynna. The story with curry and spice did not end with the yee sang platter as there was more to come. Steamed Giant Estuary Grouper Fillet with Homemade Assam Jawa Sauce gives the Lunar New Year menu a local flavour to a Chinese celebration. “Most Malaysians like spicy food and I have a menu that will cater to the Malaysian palate,” said Lam. 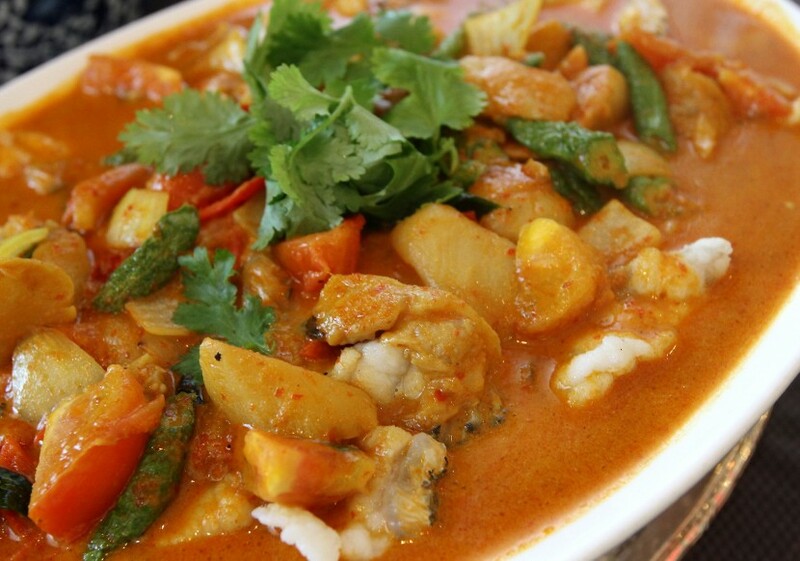 In the Steamed Giant Estuary Grouper Fillet with Homemade Assam Jawa Sauce, the familiar use of curry leaf, tamarind and chilli got their pride of place on Chynna’s menu. Another dish that got us wishing for more is the Wok-fried Omega Egg with Curry Flavour, Australian Scallop, Prawn and Garden Vegetables which was simply yummy. 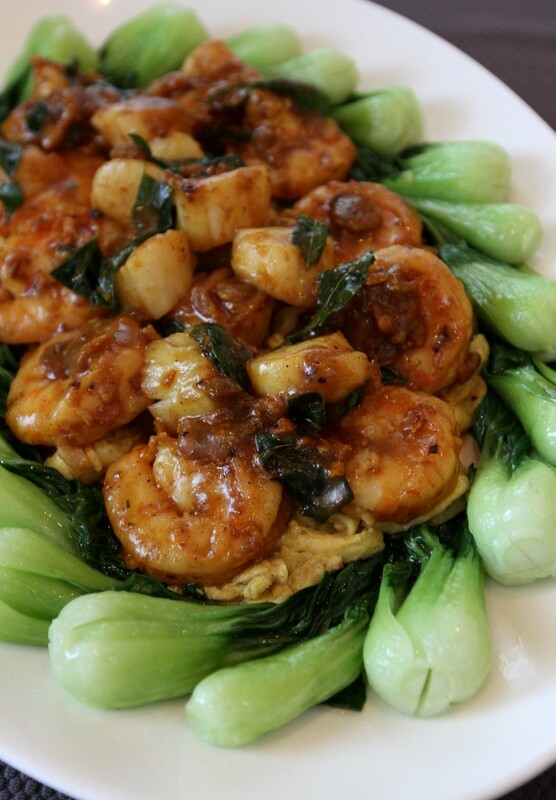 Wok-fried Omega Egg with Curry Flavour, Australian Scallop, Prawn and Garden Vegetables is rich with ingredients and flavour. Even in the soup course, Lam’s Braised Jade Soup with Monkey Head Mushrooms and Prawn Meat, the flavour profiles came through in each spoonful. In this somewhat shocking green spinach soup, the soft heat of ginger caresses the taste buds. Lam incorporates, other than ginger, garlic, chicken stock and includes prawns as well as inoki mushrooms to fuse the flavours together. 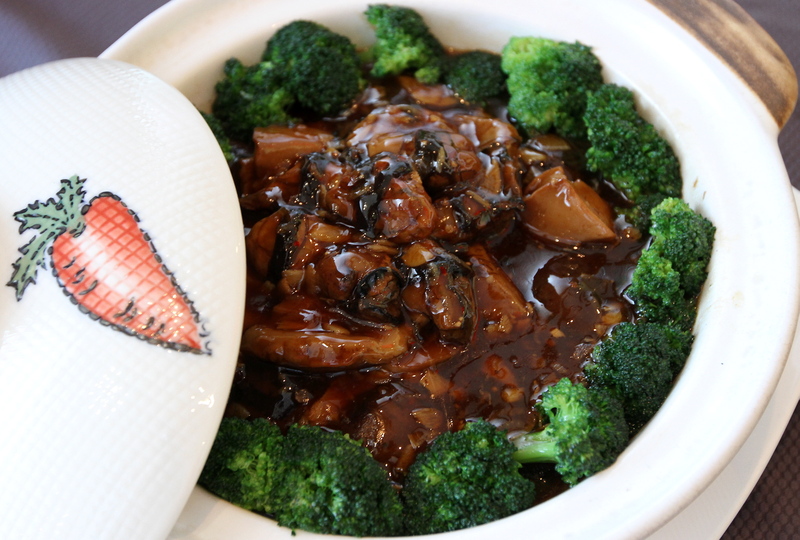 Claypot Stewed Abalone with Sea Cucumber, Sun-dried Oyster, Fatt Choy, Mushrooms and Bran Gluten is a dish that is filled with ingredients considered auspicious. Lunch was a complete eight-course experience with Rock Salt-baked Chicken stuffed with Ginger and Tea; Claypot Stewed Abalone with Sea Cucumber, Sun-dried Oyster, Fatt Choy, Mushrooms and Bran Gluten and Poached Hong Kong Egg Noodle with Mince Chicken Beijing-style. Priced at RM298 nett per person, my Chinese New Year meal was nicely finished off with a soft Panna Cotta, Crushed Peanuts Nian Gao. The other yee sang options here include Traditional Norwegian Salmon Lo Sang, Jackfruit and Strawberry Lo San, and Caesar Salad with Grated Parmesan Cheese, Norwegian Lo Sang as well as a variety of set menus to make your celebration extra special.